Item # 301550 Stash Points: 1,999 (?) This is the number of points you get in The Zumiez Stash for purchasing this item. Stash points are redeemable for exclusive rewards only available to Zumiez Stash members. To redeem your points check out the rewards catalog on thestash.zumiez.com. One sunny afternoon, at the crossroads of Fit and Fashion on Freedom Highway the Cross Colours Color Block Racerback Sports Bra was born. This single-layer stretch cotton bralette offers a pullover design and a CXC logo embossed underbust band for comfort. 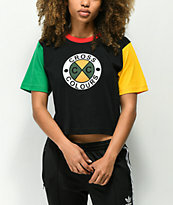 Color Block Sports Bra from Cross Colours. Black, green & red color scheme.